There have been 340 images uploaded to this topic. (View topic image gallery). You're currently viewing posts by Pinsider PeterG. I changed the GI to LED. Very nice, I used most red Leds, green with the goblin and warm whites around the bumpers. Next is to change the playfield. Who has upgraded the red or orange DMD with a Color led DMD? And is at the investment worth? 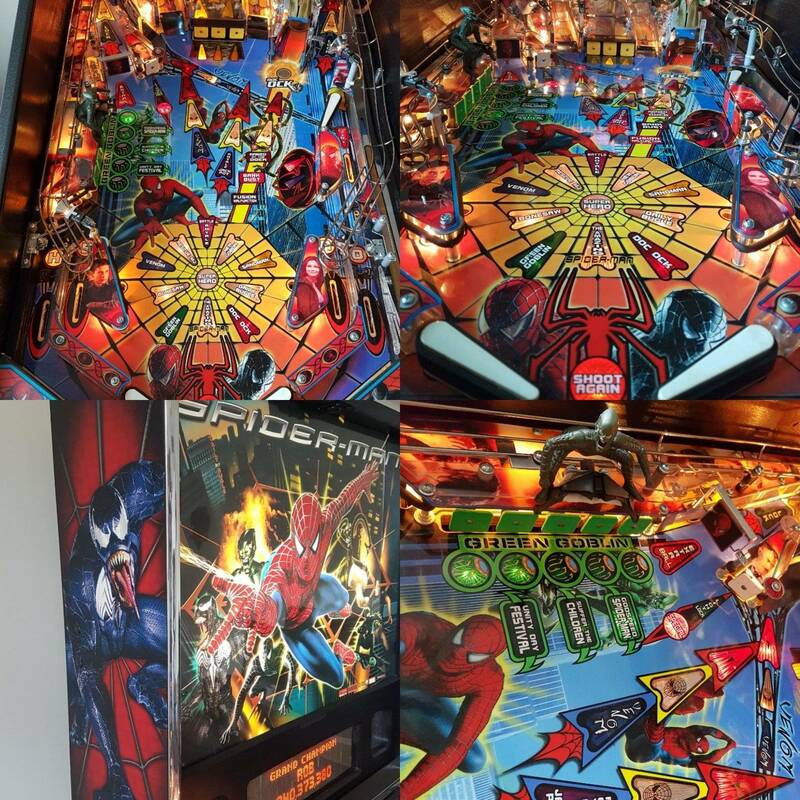 Can anybody upload some video of a color DMD on Spidy, especially the movie scenes, will they improve? The video looks good. Maybe I should start saving. 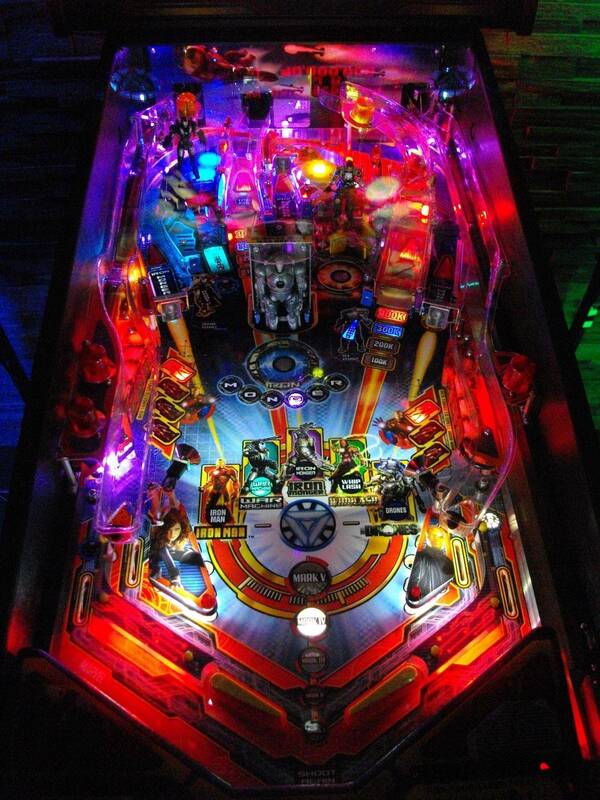 That OCD board looks interesting, I haven't updated the playfield with leds yet, what do you all think? Can you start with leds and later add the OCD board? Or will that not work with the dimming issues on the field? 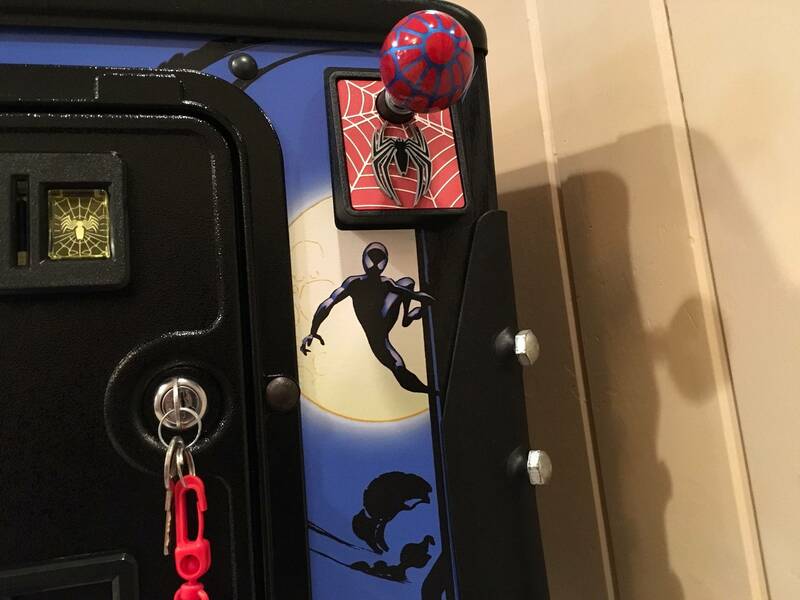 Looking at the video again, you have the display set to black and white, certainly a nice look, especially with the blacksuit multiball. Just wonder if you checked with other modes? Is there a all color mode, or a red mode? 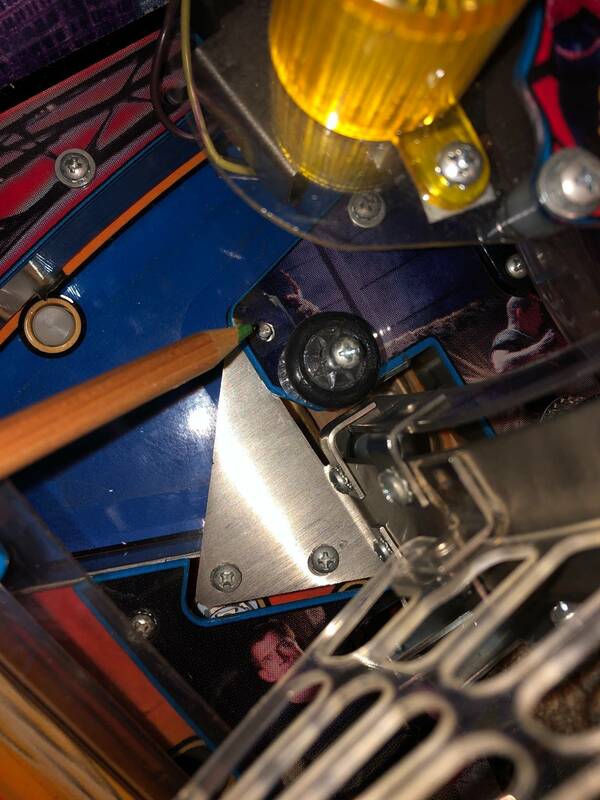 Any one occasionally get ball hang ups in the lower pop bumper area? I've looked to see if missing any rubber rings or anything else and game is clean and kept well waxed. Pitch is 6.5 degrees. Happens to me also, just a little bump to get things going. 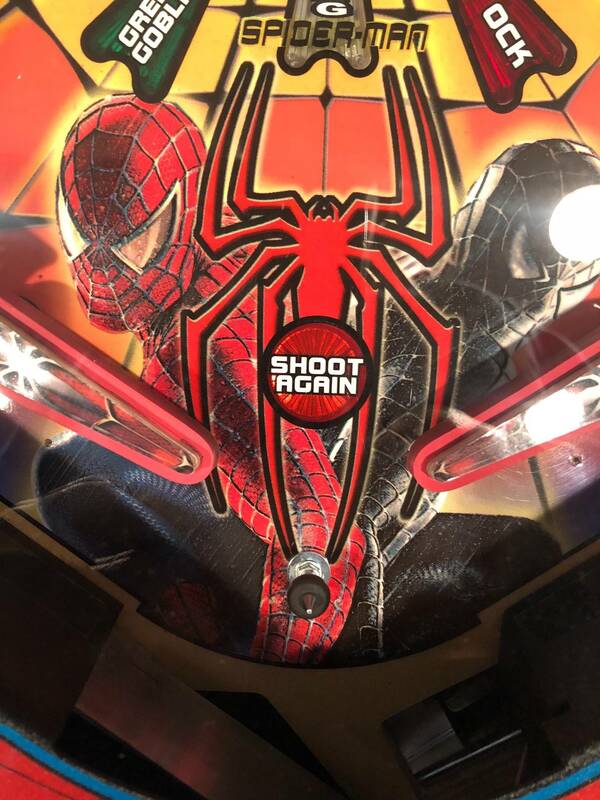 Sometimes the ball hangs on the lane diverter or when you shoot Venom. I just think that the speed of the ball is sometimes to slow. Anyone own SM and ST? How do they compare and which do you prefer? That is a tough one to compare. Owning a SM and not the Star Trek I would say Spidey. But I played ST a lot and liked it too. The themes are of course different, both movies but different. The shots seems similar but there are differences. Doc Ock shot is very nice with the interactive figure and the magnet. The Sandman shot is also different with the target bank before it. The call outs in Spidey are great (if a deranged scientist asks you to come to a product demonstration....don't go!). 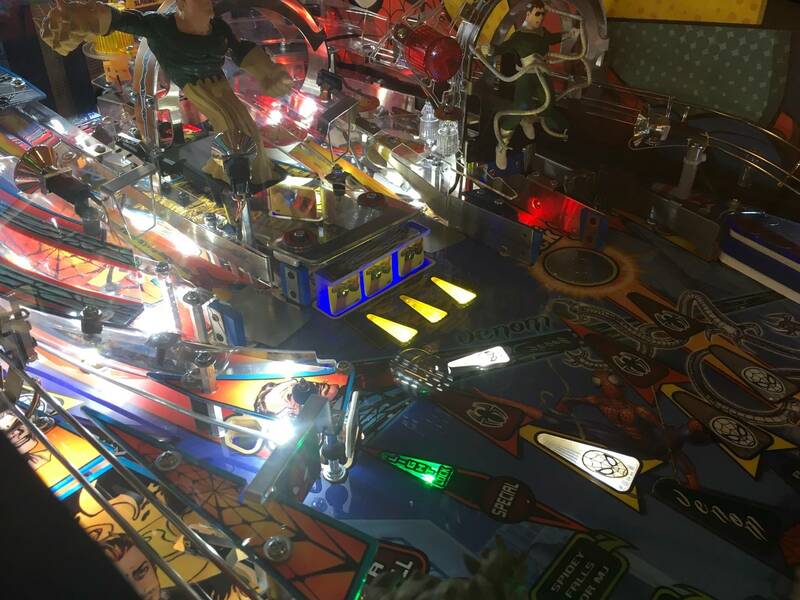 I played a ST LE and the machine is awesome, the leds and laser are great, the backboard of the playfield is also nice with the nebula. The toys are good. A true LE. The Spider-man I have is a red one, as I like Spidey to be red and not black. As stated the Black was one of the first LE's from Stern and really not much different. So If you like Star trek I would say pick up an ST LE, if you like Spider-man, pick up a Spidey, that will be cheaper too I think. Both games will not disappoint you. You will still lose the fading/brightness effect telling you what villain levels you are on. And the cool pulsing effect from the villain spotlights. I added Led to all insert except the villain modes. Those are just colored incandescant lights. It looks great. The pulsing effect from the villian spotlights is something I have never noticed? Are these the only lights in the game that work with fading? middle section? I haven't noticed the pulsing effect from spotlights, so I think I will led them in any case. Well I also looked at a standard stock SM. 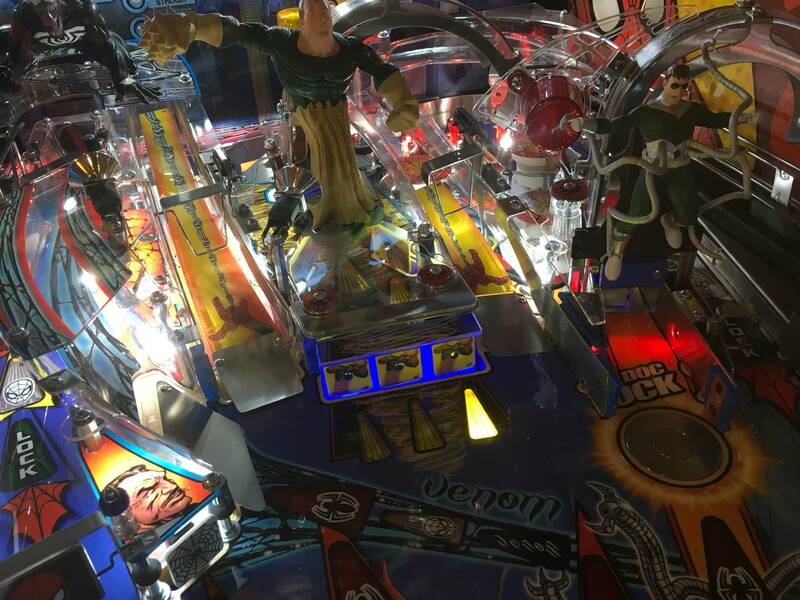 I did also not see any fading effect with the spotlight on the villains, only the four arrows in the ring. The rest of the ring is just on or off. Use good led's because some I tried kept flickering and glowing. Now mine is almost finished, as I noticed one flasher I forgot way back left under Venom. The machine really brightens up with led. Didn't even realize there was a club...and still not sure if should be sharing this here or another thread? some love for a grand slam pin. for anyone asking, my opinion- LED everything. That is one hell of a machine, I think this contains all mods out there. I like the speaker decals of the VE version, hope they will sell these. For the rest, I like my old spidey, it's huo, it's fast and I love the call outs and movie parts. I am more a movie fan than a comic fan. Replaced the slingshots put led in it, just an awesome machine. No need for a VE here. 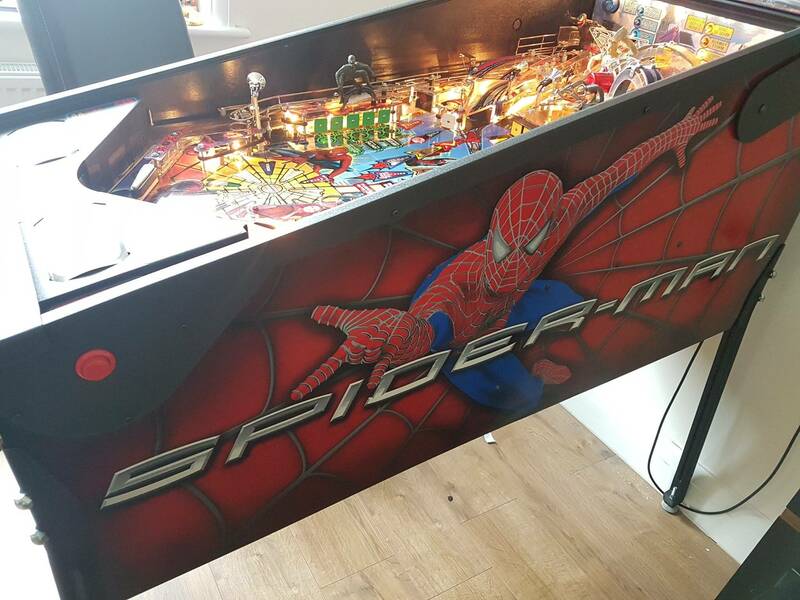 But if you do not have a spidey but do have some spare change, I would certainly suggest you to pick up a VE, you won't regret it. 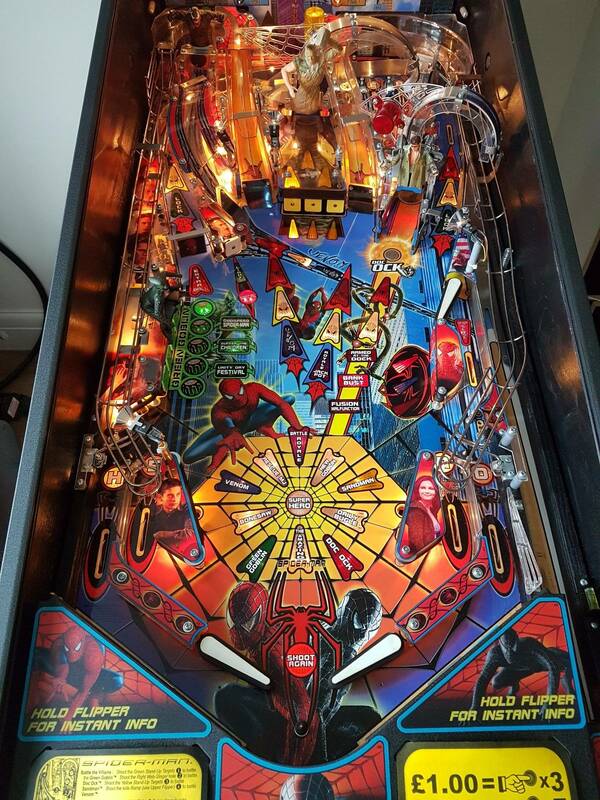 I have on old Spidey and just installed the metal protector - on wood off course. For the rest I did not do any protection. In a HUO environment wear is minimal if you keep the playfield clean and fast. Only thing I have in all those years is a small bit of plastic chipped of in the pop bumper area, things often go wild around there. For the rest it is still in pristine condition. With the new Doc Ock protection on the VE I think you should not worry at all. I wonder if the outside ball guide is mis-shapen. Not sure if I'm at the same angle as you in this pic, but your guide seems to maybe just be out over the black line. Could just be the angle though. 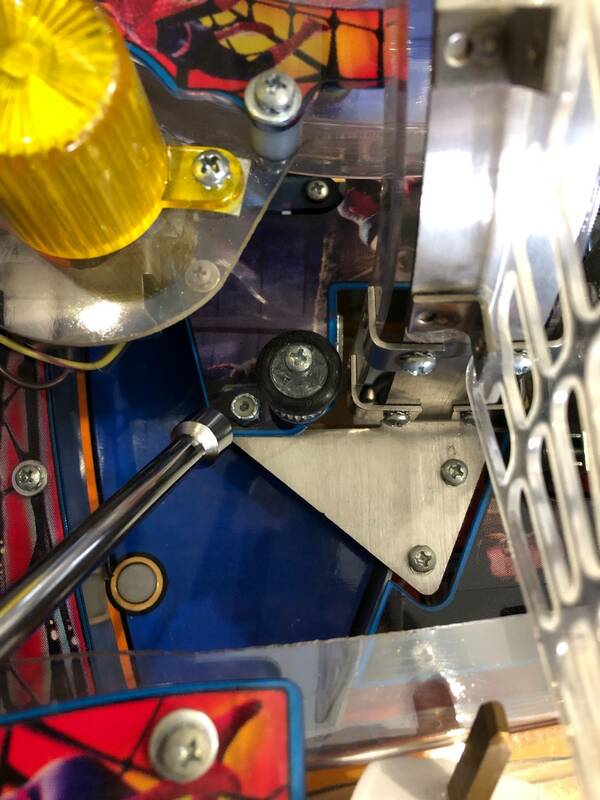 I have about 1mm clearance when the ball goes through there. Are those dimpels on the magnet?? The clearcoat on the machine looks very nice. I like the idea, could you create the projection image yourself? Is that easy to print? I bought those cheap ones, see if i can open them up another picture in there. Then i think i Will do it with all my pins. Like cftbl should be great. That is really cool, I am not a topper person, tried it, but not my thing. So this is great! Clean but still very attractive. 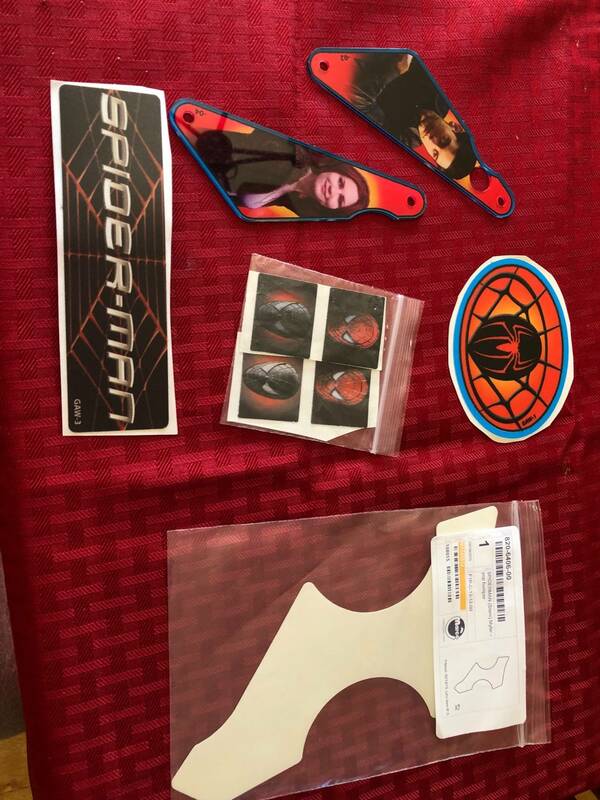 l purchased the "Spiderman Vault Edition" speaker decal from Stern. Not that expensive l paid $33 AU shipped to Australia. Keep in mind this comes with the round speaker cutout and you will need to cut it for your square speakers. Did you just send an email to stern, I do not see anything in their store? l ordered the part from my local Stern reseller. 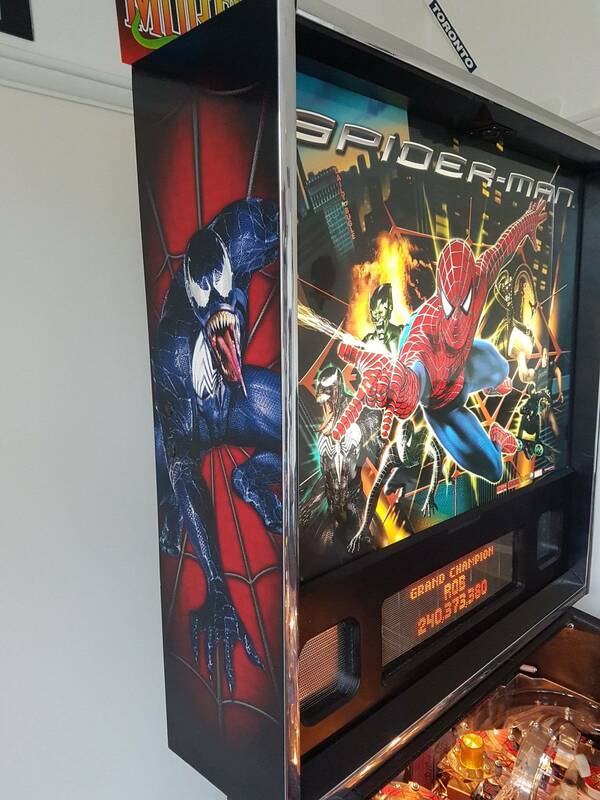 In case you need the details part number is 820-8369-A0 Spiderman Vault speaker panel decal. Yep, it's the clip where GG gasses SM and says sleep, sleeeep. I never new that was it, I thought it was some guy with a chainsaw? I need to get that colorDMD. Also, not sure I want to do a color DMD in this but wanted to know where you could get a red filter for the regular display? I bought a red filter at Pinball Life. I never quite understood why Stern left the speaker panel boring black. I decided to make my own for Batman and Spiderman. I'm installing tomorrow. Very excited! Like that Spiddy version? I was planning to buy the VE decal but that was difficult to get. Otherwise I was planning to make something myself. Tron and POTC is also on that list, although Tron is already nicely doen by Pingraffix. Maybe you can share the file and I can print it myself on a nice decal? I did buy the VE decal and it does not fit at all (speakers and dmd ). That's the main reason I did my own. I also did a Batman. I do have some spare ones $35. I like one, can you send that in a secure way to me, I will PM you. Brand new to the website and to owning my first machine. Brand new Spider-Man VE. I read the forum and got a lot of great tips but I had some questions I hoped the group could answer. 1. With a machine made just a few weeks ago do I need to update the code or does it have it loaded already? 2. Do I need to worry about ghosting in the VE or should I not since it has all LEDs? 3. Any mods or additions that are a must? Noticing a hole in the board already where the sandman shot spits out and read this is an issue so covering up with more Mylan. 4. 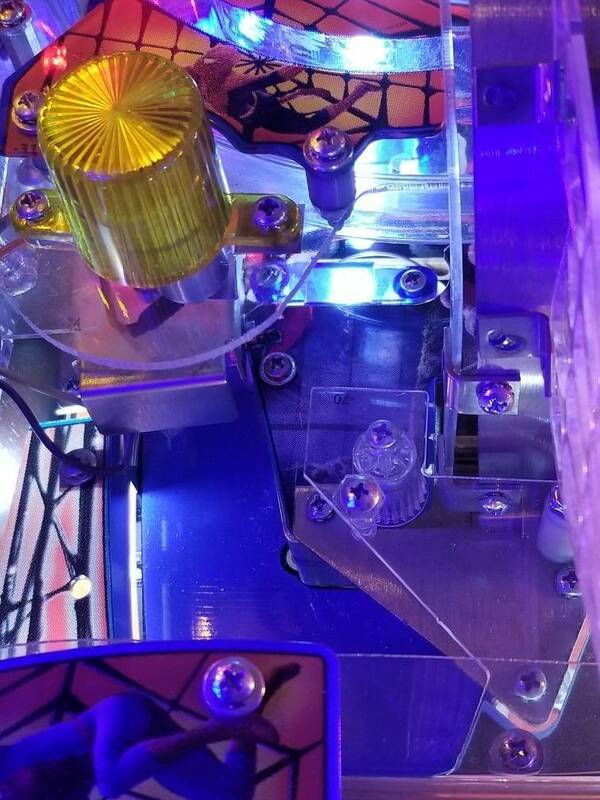 Final question and most important one : does anyone else's machine have a really hard time making the left ramp? 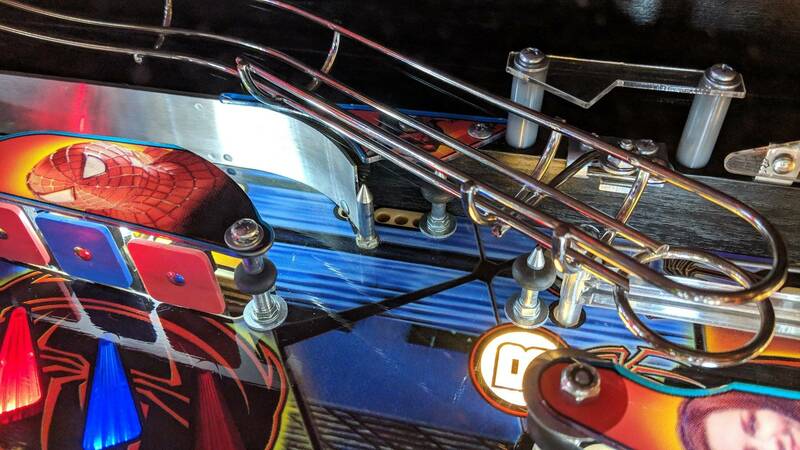 The flipper seems weak and the metal ramp plating is starting to curve up. Thanks guys and glad to be a part of this group!! 1- you can check the code on the service screen. I do not the no it need updating since SMVE Has no recent release. 3- the sandman return on SMVE is a known area for wear. Adding Mylar there is a good idea. I personally am not a fan of cliffy protectors all over the field. Wax and new pinballs each year and you are ok. Other mods? I like mirror blades, a colored led screen is super for SMVE. 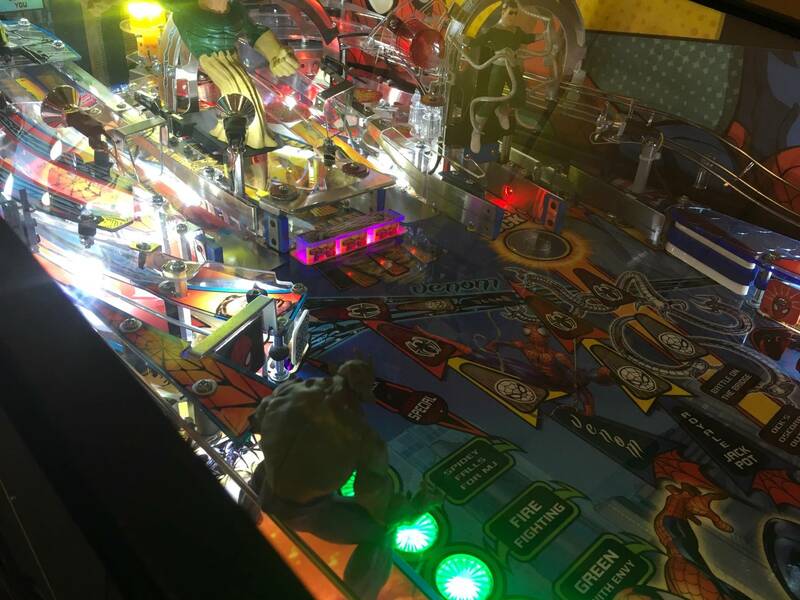 Cabinet under lighting, lighted flipperbuttons, etc.....you can go all the way. On the ramp. I do not have that issue. The left ramp is ok to hit with the upperflipper. Metal ramp curving up sound not ok. Huh??? I think the OP was referring to LED ghosting (lamps weakly or solidly illuminated when they should not be), not the improper more recent use of the same term to describe clearcoat lifting issues observed on Stern playfield. OK on that, no worries there, modern leds are not ghosting in any way. At least not on my machines (Tron LE, GB LE). Even after market leds are ok now. If you have any problem put a OCD board in there. Seems to work great. Well you can touch up that part with some orange paint and put some clear on that, or precut mylar. I think most will not even see that. You must start the mode and sit it out. You do not have to play the made and reach it like in GB. Just wait and start the next mode. Where do those web plastics under the slingshots come from? I like the clear ones instead of the colored in most games. I think almost all agree that there is little to tweak on the original sounds and call outs. It is my only pin with standard sound. 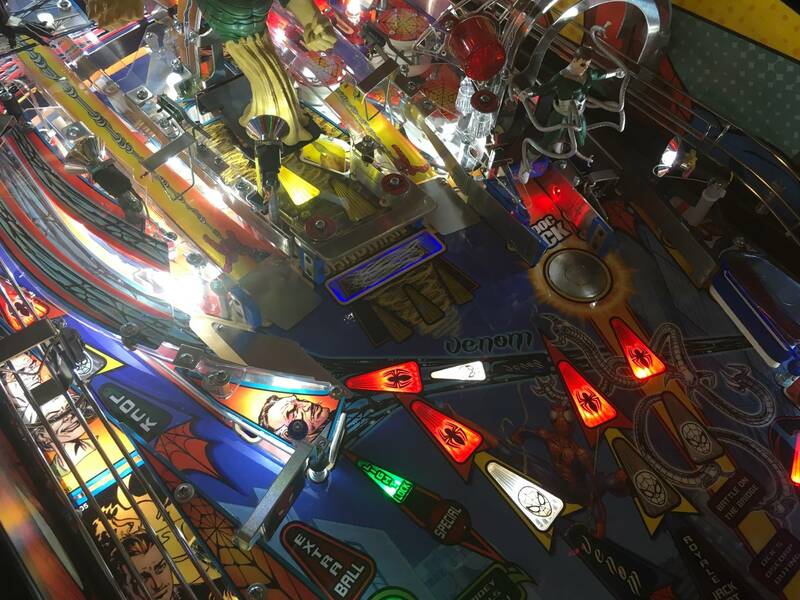 One Google and you will find an excellent write up by Pinball News. Does anyone else think the back alley train car mod is way too big? yes, I do. TRhe buidlings are ok, but the train is way to big, i.m.h.o. On a regular SM the blue looks better. Chrome looks better for the black edition.